HTTPS filtering is a must for any network admin these days and if you implement HTTPS filtering using SSL Bumped Squid you have surely seen the X509_V_ERR_UNABLE_TO_GET_ISSUER_CERT_LOCALLY error. 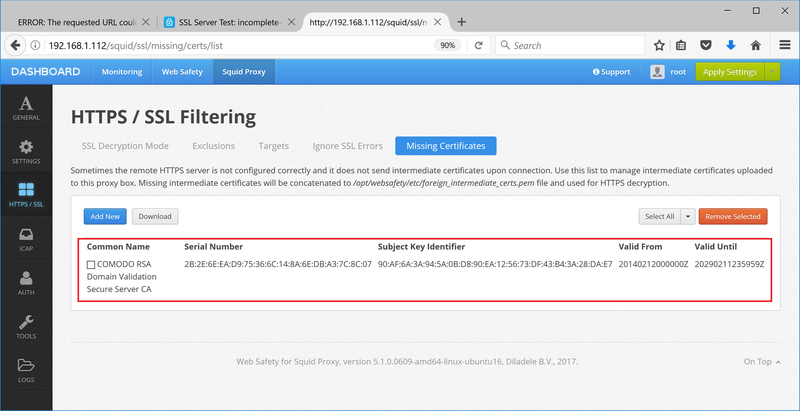 The main reason for this error is very simple – one (or some) certificates presented by the remote HTTPS site are not present in the certificate store of Squid proxy server. Because of that Squid cannot generate mimicked SSL certificate required to perform HTTPS filtering. 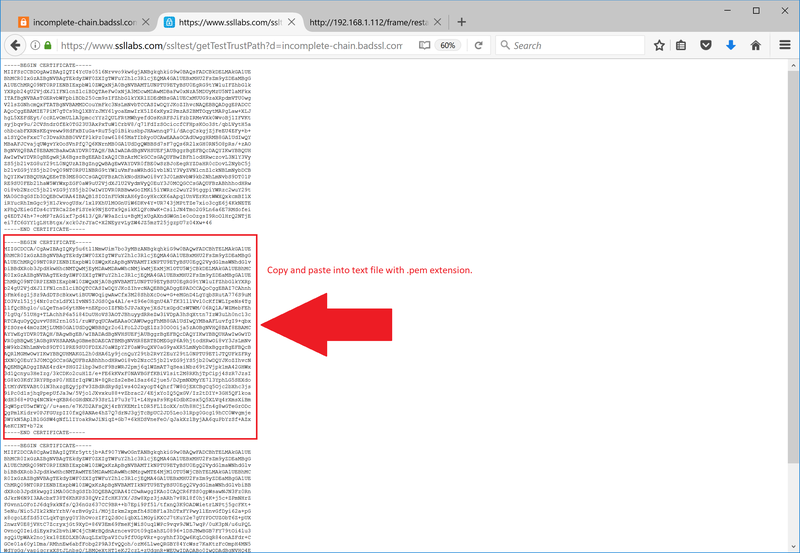 Let’s take https://incomplete-chain.badssl.com for example. If you access it directly (FF or Chrome or even IE) you will not see any errors. If you do the same through HTTPS filtering proxy the following error page will be appear in the browser. 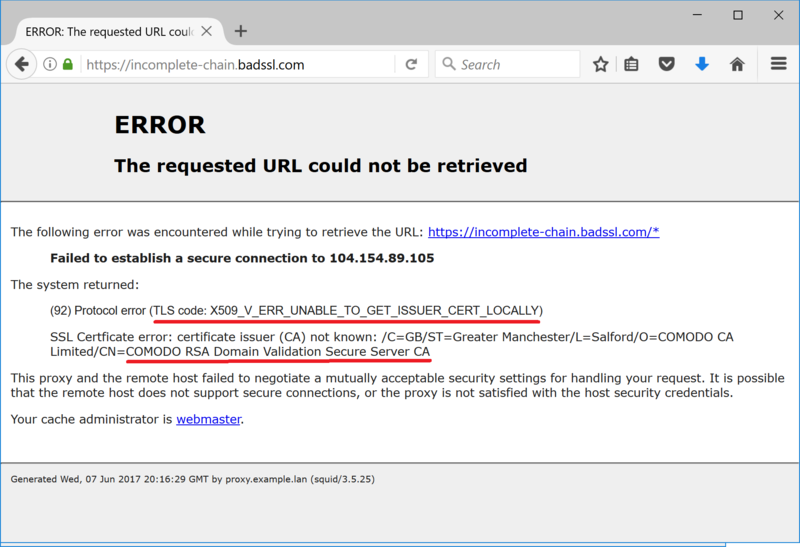 It is missing because the administrator of the site incomplete-chain.badssl.com has configured the web server incorrectly - according to current web standards the server MUST present all chain of certificates up to (but not including) the root certificate. In this case only the site certificate is presented by the web server and other certificates in the chain are left away. To prove that we can go to online SSL Server Site Check Tool at https://www.ssllabs.com/ssltest/index.html. Type the incomplete-chain.badssl.com into the search field and click Submit. The tool will respond with results showing “Incomplete Chain” error as inidicated on the following screenshot. Scroll the result page down and see what intermediate certificate is missing from the chain. This page explains more about what intermediate certificates are https://www.godaddy.com/help/what-is-an-intermediate-certificate-868. To fix this X509_V_ERR_UNABLE_TO_GET_ISSUER_CERT_LOCALLY we must manually download the missing certificate and install it into the system. There are two ways of doing it. 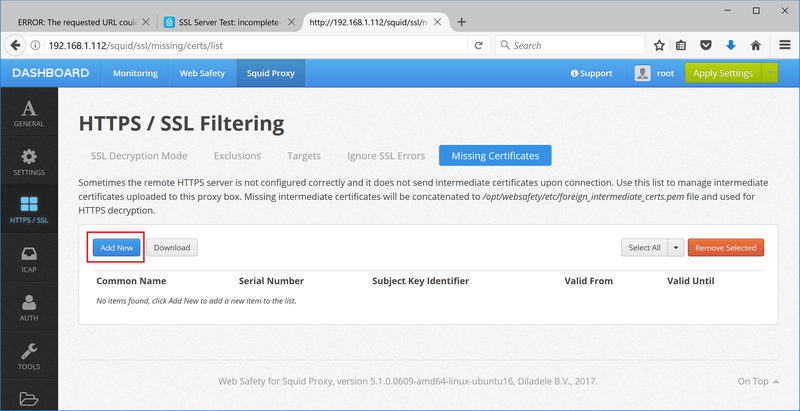 Web Safety has the ability to add the missing certificates to the Squid intermediate certificate storage. 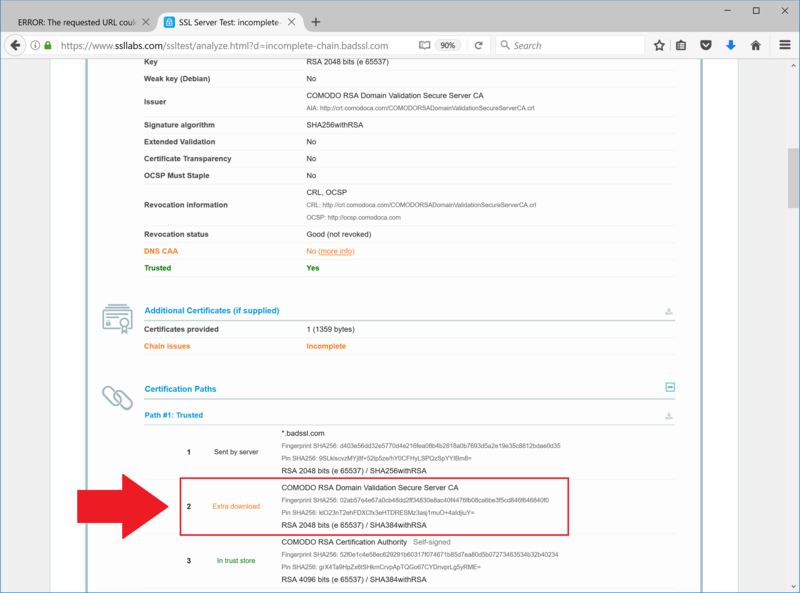 Navigate to UI / Squid / HTTPS / Missing Certificates and upload the PEM file for the certificate as inidicated on the following screenshots. Click Save and Restart to load the storage into Squid. After that access to https://incomplete-chain.badssl.com will be successful. It is also possible to add this certificate to operating system’s certificate storage. This method is generally not recommended because adding an intermediate certificate to the root certificate storage makes is “globally trusted” and this usually too much for the purposes of HTTPS filtering. Ensure intermediate certificate ends with .pem (this is required for CentOS 7). Open root terminal and copy the certificate into /etc/pki/ca-trust/source/anchors/ folder. Run update-ca-trust command to rebuild the system certificate bundle. It should finish without any output. Restart Squid by running systemctl restart squid. To remove this manually installed intermediate certificate from the certificate bundle in CentOS 7, remove the certificate file from /etc/pki/ca-trust/source/anchors​ and run the update-ca-trust again. Do not forget to restart Squid! Open root terminal and copy the certificate into /usr/local/share/ca-certificates/crt. Please note, unlike in CentOS 7, the file extension needs to be crt! 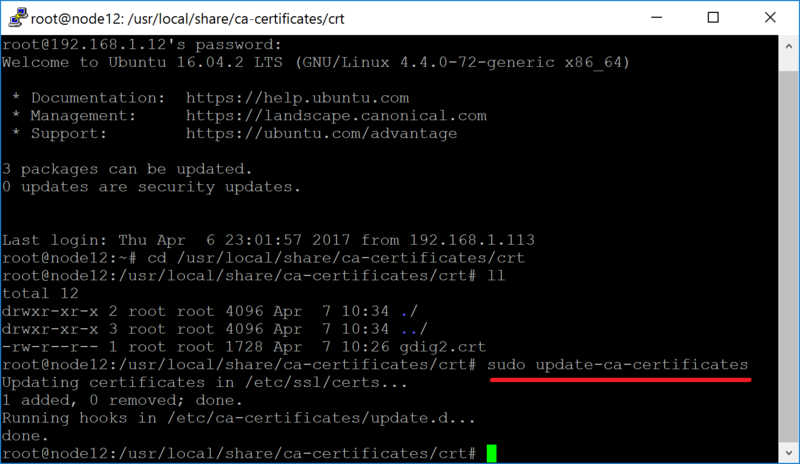 Run sudo update-ca-certificates command to rebuild the system certificate store. After that access to https://incomplete-chain.badssl.com will be successful. To remove this manually installed intermediate certificate from the certificate bundle, remove this certificate from /usr/local/share/ca-certificates, run sudo update-ca-certificates and finally remove all dangling links to non existing certificate in /etc/ssl/certs folder. 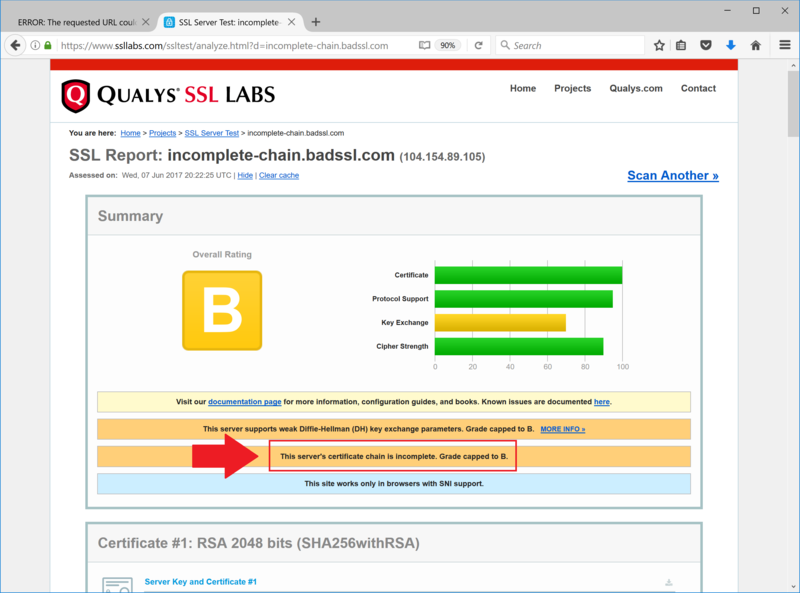 UI of In Web Safety has a new tool SSL Certificate Test Tool. It lets the admin easily download the missing certificates. The following screenshot shows the output of the tool for the sample site with incomplete certificate chain. Please note this tool does not work for sites with wildcard certificates yet. It is also possible to download the incomplete chain from SSL Labs result page, but then you would need to manually take only the missing certificate from the output.